Let’s face it. We could all use a little more peace and positivity after the traumatic events that have occurred in this country and around the world of late. We need to come together, to show our love for one another, and to unite. One small way we can contribute is by simply being cheerful! With these 12 fabulous items you can show that you want the world to come together in peace and positivity. The sleeveless solid Come Together Ashley Tank from Peace Love World begins with a crew neck, and fits naturally on the frame with dropped armholes, ending with a slightly longer length with a split hem at both sides. Who doesn’t want comfy hoodie featuring a tropical hibiscus print? The Spiritual Gangster ‘Happiness Is The Way’ Hoodie from Nordstrom is a feel-good saying that will add a little happiness to your namaste. This sleeveless Vote For A Peace Love World Lunes Top from Peace Love World begins with a scooped neckline, slim and straight fit, and a split-level hemline that’s shorter in front and longer at back. On this sterling silver ‘Just Peace’ Charm Bracelet, the international symbol of peace is beautifully highlighted. 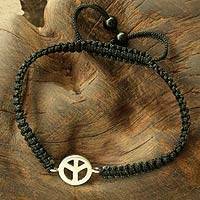 Crafted in India by Hema for Novica, it centers a black braided bracelet that can be adjusted to your desired length. Old Glory gets a peaceful update on the front of a laid-back tank available at Nordstrom. The O’Neill ‘Peace Flag’ High Neck Graphic Tank is made from soft, lightweight cotton. Your favorite jeans just found their soul mate. 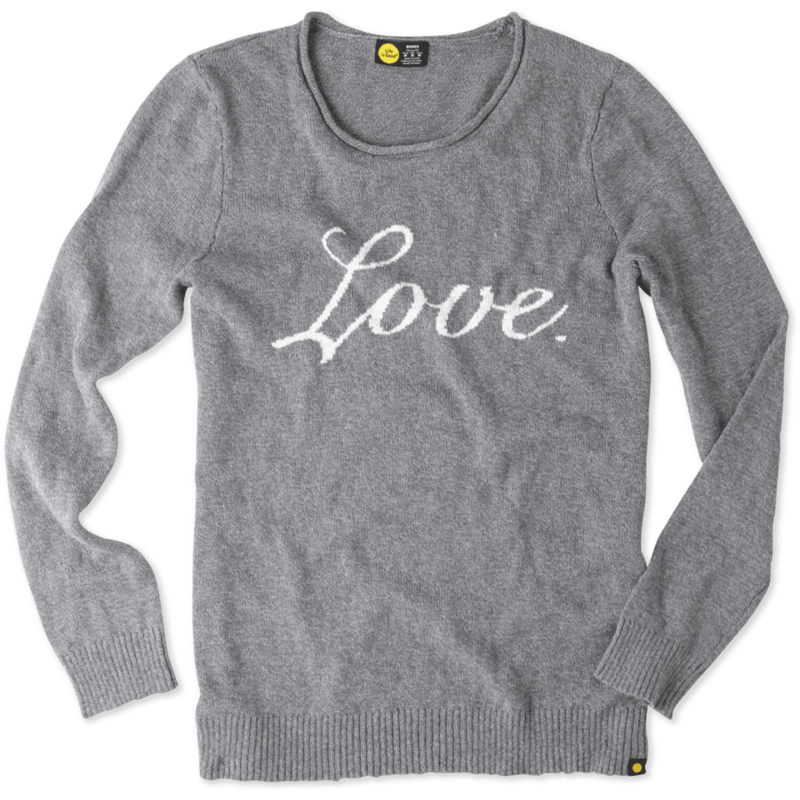 In 7 gauge cotton slub yarn, with rib cuffs and hemming, this long women’s Love Slouchy Sweater features an intarsia graphic on the front and a Life is Good label at the hem. The dove is universally recognized as a symbol of peace, faith, and truth. Graceful and gentle, the bird is believed to be divine. Wear this Sacred Dove Pull Cord Bracelet from Alex & Ani as a totem of new beginnings, a reminder that everything is going to be alright. The universally recognized symbol of peace becomes a pendant necklace in the hands of Thai artisan Nadine for Novica. 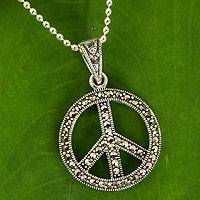 This Peace Sign Necklace is crafted by hand of sterling silver and studded with sparkling marcasite. The ‘Peace’ Burnout Crewneck Tee sold at Nordstrom is a bold declaration of peace fronts an easy, relaxed-fit tee mottled with casual-cool burnout patterning. These Darn Tough Peace Women’s Ski Socks from Campmor have a layer of cushioning along the bottom of the foot that adds extra support and comfort. And since Merino Wool is naturally antimicrobial this sock repels bacteria and odor. If only everything in life was this simple. Get happy, wear happy. The simple Happy Long Sleeve Shirt from YogaOutlet.com is a great statement-making cover-up, especially for before or after a workout. Here’s to make today peaceful and positive! Disclosure: There are affiliate links in this post. The purchase price of these items remains unchanged. I hope you enjoy them!